20 years shoemaking business that opened 3 years ago and Fatma's Ertarg, hugging tightly to the work area is dominated by men. Kahramanmaras in 20 years that shoemaking and 3 years ago he microcredit opens office with the support of Fatma Ertarg's, the customers generally clinging to jobs in areas where the men obsolete or gives almost life with shoes that need repair. 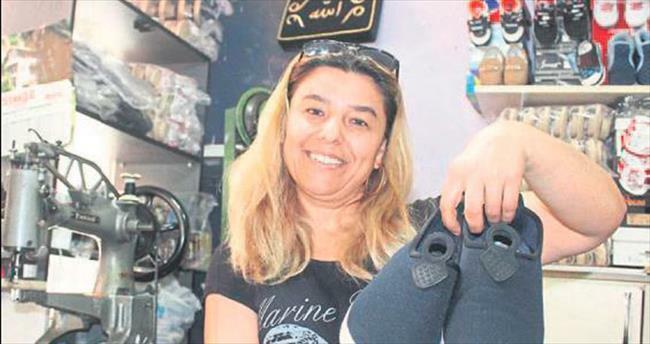 Onikişubat living in the district 41-year-old mother of 2 Ertarg the middle school years in the shoe repair cobbler uncle of the profession has learned to come to him after a while. Initially, the work began by repairing shoes Ertarg of their neighbors, their relatives, led work with micro-credit support received 3 years ago. Contributing to the livelihood of the house and the money earned by their children's education Ertarg, which is now preparing for the future happiness of their children by making that dream job. Ertarg describing it works in a very different work shoes, micro-credit, he said pulling open a small business by combining their own deposits. Women explained that often surprised to see that a woman who does not know himself repairing shoes of the customer in the profession Ertarg, some customers were able to approach the transfer bias. Ertarg said, "I do my job well my ads. Some customers' Women came from, she is an artist, singer becomes one that was missing" as they speak. After receiving the shoes are also apologize, "he said. Click for the original notice.